The laglag bala scam, also known as the "tanim bala scam" or simply "bullet scam," is causing a stir in the country. And because it's happening in the NAIA Terminals and putting foreign passengers at risk of being victimized too, the scam's become a hot topic all over the world; international news agencies like Time, BBC, and CNN have already featured it. There's a game now on Google Play called "Bullet Planner" that's based on it, and the description reads "These greedy administrators want to plant a bullet in your bag and if they succeed, you'll end up paying $1,000. Of course you would not let them do that!" A Japanese TV show created a skit to demonstrate how the extortion scheme works and to show how to avoid it. So how does the laglag bala scam work, if it really is a scam and not just a bunch of people carrying bullets as anting-anting (as claimed by NAIA airport security)? It's been said that airport security staff plant the bullet in the luggage in a few ways. They do this by telling some passengers to weigh their carry-on bags before they have their second X-ray scan, and that passengers have to open their bags and spread their things around. The bullet could be slipped in when you're busy unpacking or repacking. A simpler one would just be to slip the bullet into your bag's side pocket. And when the bullet is detected in the X-ray, the staff will extort money from the bag owner. The idea is that you're rushing to catch your flight and can't be hassled by legal charges and a six-year detainment (bullets are an illegal possession), so you just pay to not be reported. The amount? Around $500 to $1000 or P20,000 to P40,000, according to tourists in 2012. That's right. It's been happening before this year even began. A tourist posted a warning on TripAdvisor in 2012. 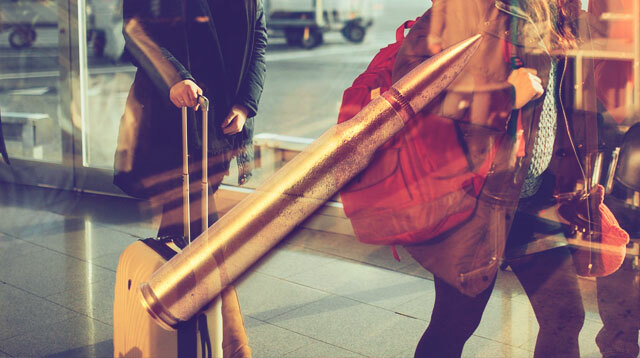 In 2014, 1,510 travelers were caught with bullets, and 6,600 were caught from 2012 to October 2015. Take note: These numbers are of people who were reported, meaning they didn't pay the demanded amount. How many would've just paid to carry on with their travels? The DOTC's Office of Transportation Security says that 1,394 passengers were found to be carrying a bullet in their bags from January to October 2015. The PNP's Aviation Security Group, which has the authority to file criminal cases, says that 139 cases were found in the same span of time, and 51 were filed in court. If you do the math, you'll find that 1,255 cases weren't reported, meaning 1,255 people paid up. And assuming they paid at least $500 or P20,000, the laglag bala scam would have yielded at least $627,500 or P25,100,000. Yes, that's MILLIONS of pesos. If it's been going on since 2012, why is the scam only a hot topic now? Social media may have something to do with it, as hazarded in The Manila Times. Social media circulated the story of an elderly OFW who was caught with a bullet, refused to fork in money, hence was detained for several days. Reports of similar cases involving the scam then began surfacing, and of course all those triggered public outrage and shame. In the past few weeks we've seen on the news that the targets have been OFWs, tourists, the elderly, and a teenage choir member, among others. You'd think that all this bad light shining on our country right now would make the scam stop or would make us hear of government officials criticizing the extortion and putting their foot down to ensure security (regardless of scam or passenger carelessness). Unfortunately it's still going on—why?—and many are unsatisfied with the government's response (or lack thereof). Because of the bad rap the Administration is getting, some people say that all this bullet planting is to discredit the government. Some people blame Filipinos' persistent belief in the anting-anting for the bullets in the luggage, while some believe that some public officials are benefiting from the extortion money care of a syndicate. While all these arguments are happening, the issue isn't being resolved when it has to be. Simply dismissing all this as a scheme against the government, saying that all these cases are "isolated," or blaming a culture of anting-anting is diffusing the urgency that the bullet planting has to stop because it's plain wrong and scandalous. It's even affecting the quality of the investigation and securities being taken, and affecting our tourism and our name as Filipinos as we know it.